apply online for this NIOS recruitment is www.nios.ac.in. 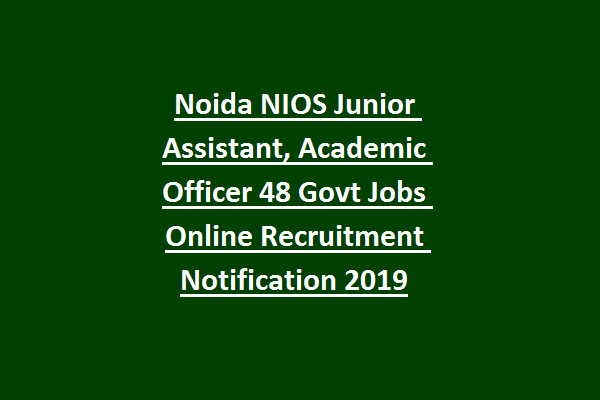 Last date to apply online for this NIOS Junior Assistant Recruitment 2019 is 17-05-2019. Candidates selection will be on basis of written exam or interview for this NIOS Junior Assistant, Academic Officer Jobs. Detailed information about his NIOS recruitment is updated below along with qualification, age limits, selection process and more information. There are total 48 vacancies in this Jr Assistant and Academic Officer Recruitment of NIOS jobs. For AO jobs upper age limits is 37 years. For JR Assistant Jobs upper age limit is 27 years. For Junior Assistant Jobs-Senior Secondary qualified candidates who is having working knowledge of Computers with 6000 key depressions on computer. For Academic Officer Jobs-Masters Degree with Computer Knowledge. Candidates selection will be based on written exam and interview for this NIOS Recruitment 2019. Apply online before the closing date of 17-5-2019 for these NIOS vacancies. 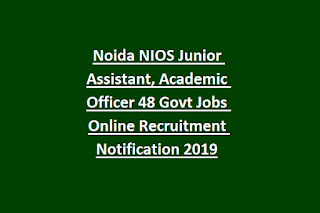 Official website to apply online for this NIOS recruitment 2019 is www.nios.ac.in.